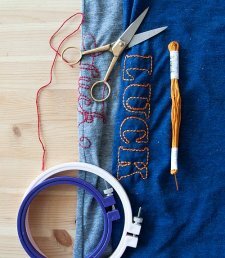 "Today’s Embroidery 101 project is inspired by a great friend who has “Luck” tattooed down her ribcage, just so she always knows that luck is truly on her side. Bold move my friend! While we’re using a different kind of needle, we’ll have the same confidence boosting outcome. "This project is a great way to spruce up an old tee. T-shirt material can be difficult to stitch on, because it’s spongy and stretchy. I’ll show you a really simple technique to make it a whole lot easier, so now you can stitch on all you tees. We’ll also be learning the backstitch today. 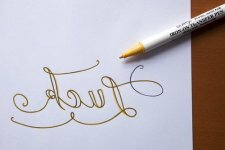 It’s a simple outline stitch that makes smooth continuous lines, which makes it perfect for text. There are an amazing amount of stitches and stitch variations, but honestly, you can make just about any project with the backstitch. So get to making, fortune favors those who stitch."